This felt wine rack mat stacks up to ten bottles in a pyramid style. 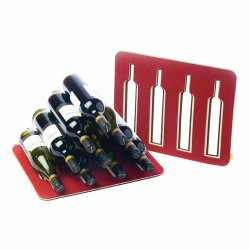 Sturdy felt in brown, red and white color combination securely hold wine bottles in place. A simple and stylish way to stack your favorite wines!